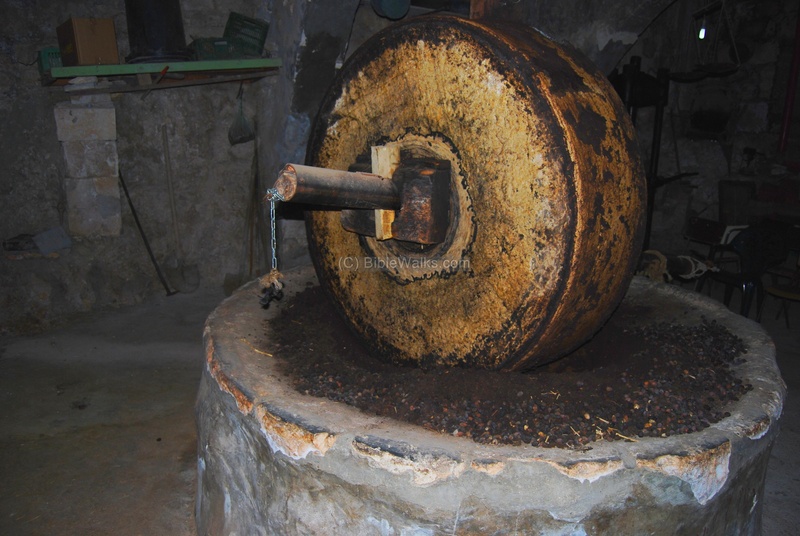 This page reviews the process of olive oil production. 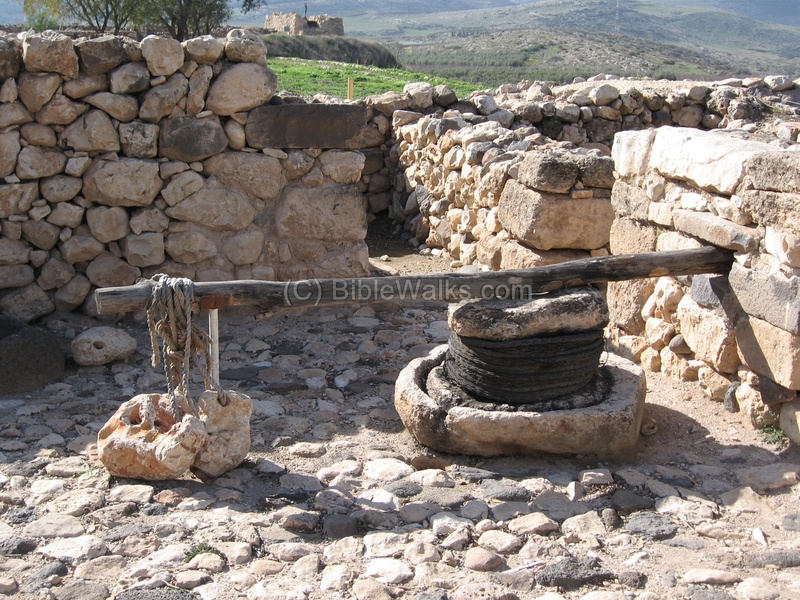 It lists the Oil presses that are featured in BibleWalks sites. 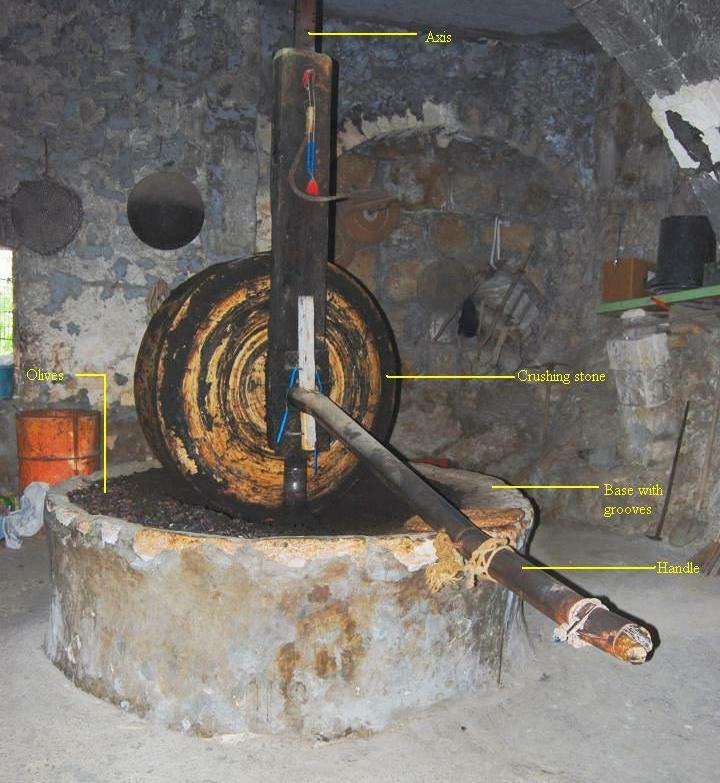 This web page describes the process of olive oil production, and summarizes the sites that feature oil presses. 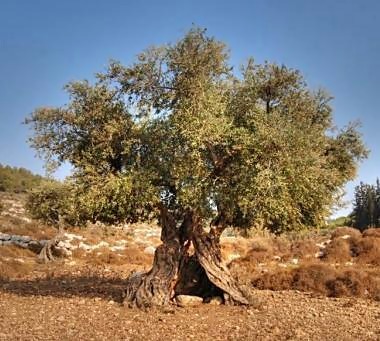 Olive oil is produced by growing olive trees, harvesting the olives (at around September timeframe), crushing them with an oil press, and collecting the golden juice. 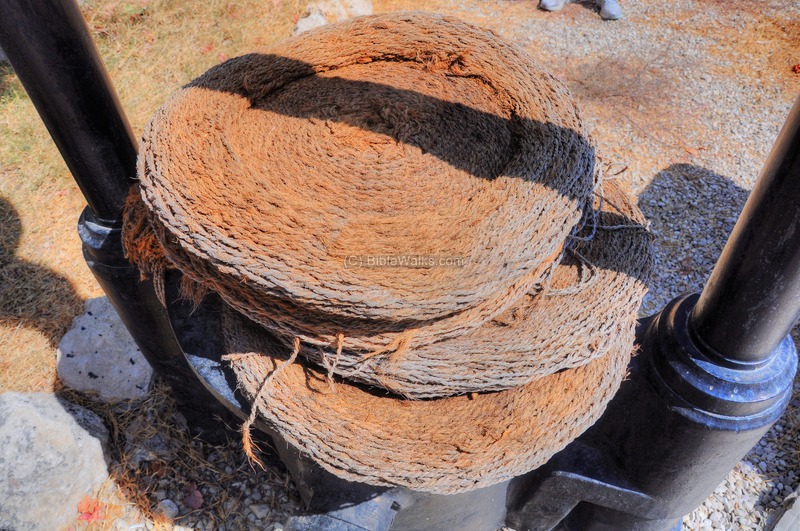 This process started about 5000 year ago, and its popularity and worth increased ever since. 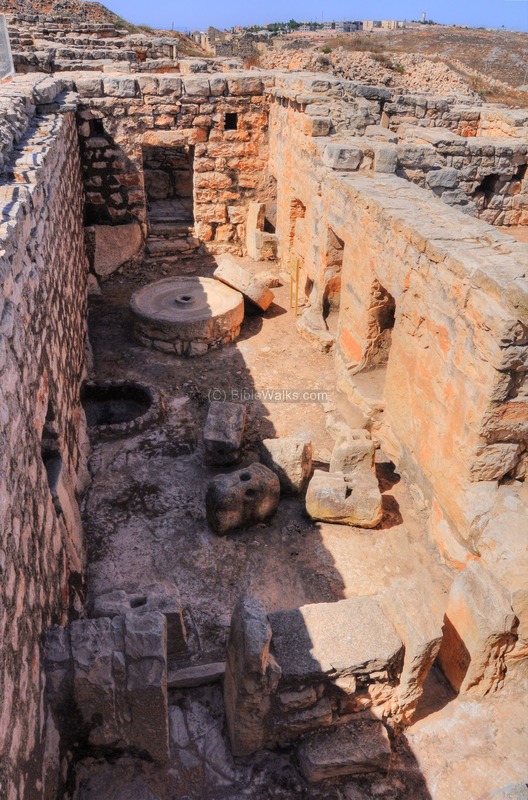 During the Roman and Byzantine periods the number of oil presses was in the thousands; many farmers had their own private installations, and larger public industrial complexes generated huge amount of olive oil. 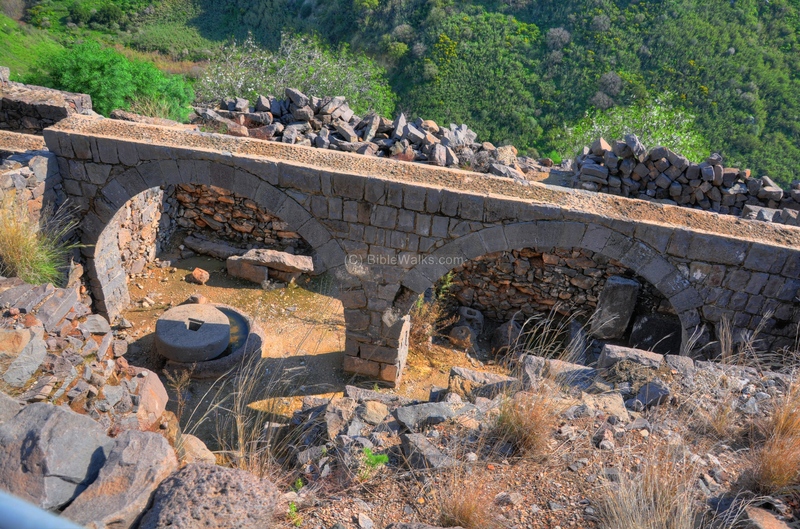 In the area of the Golan heights alone, 109 oil presses were found in 58 ancient sites (ref: Atiqot XXXIV), most of them operated during the Roman and Byzantine period. The olive oil production process was based on two major steps: The first step requires crushing the olives using a crushing stone, and collecting them into a basket. The second step is done on another installation: the basket is pressed with force, extracting the oil out of the crushed olives and collecting the juice into a storing vat. 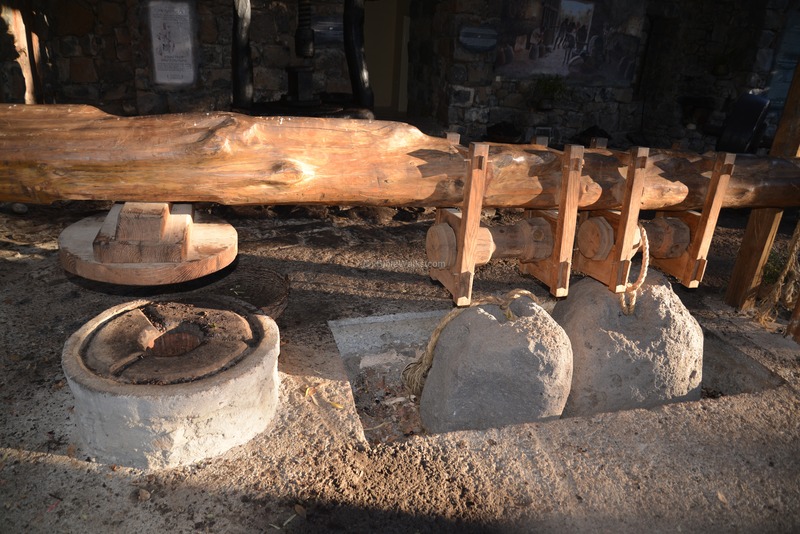 There were different types of machines that were used to crush the olives and then press the oil out of the crushed olives. They differed in their size, method of operation, use of human or animal power, infrastructure and capacity. 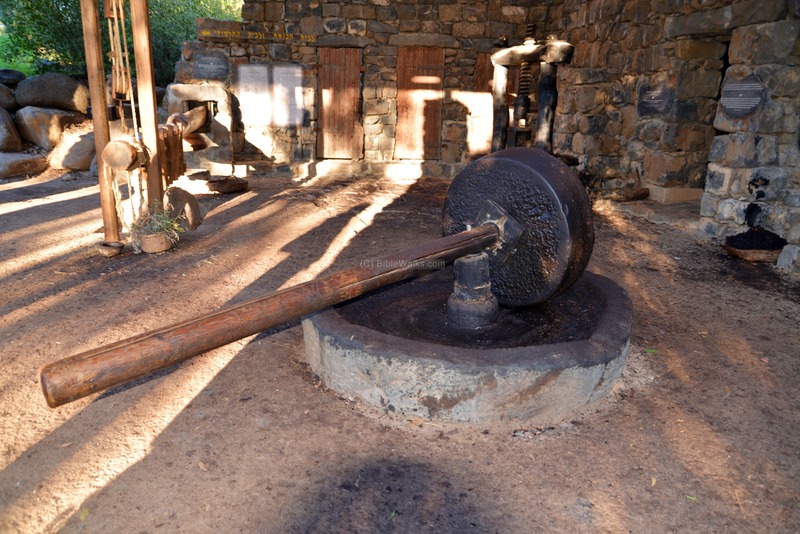 Most of the oil presses had a single crushing stone and basin, and one or two pressing devices. 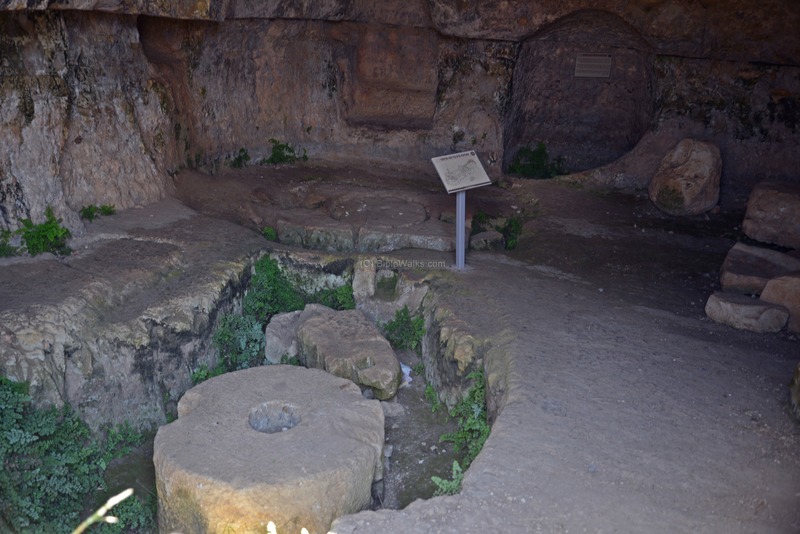 These devices were the first process of the olive oil production, where the olives were crushed and placed into a basket. 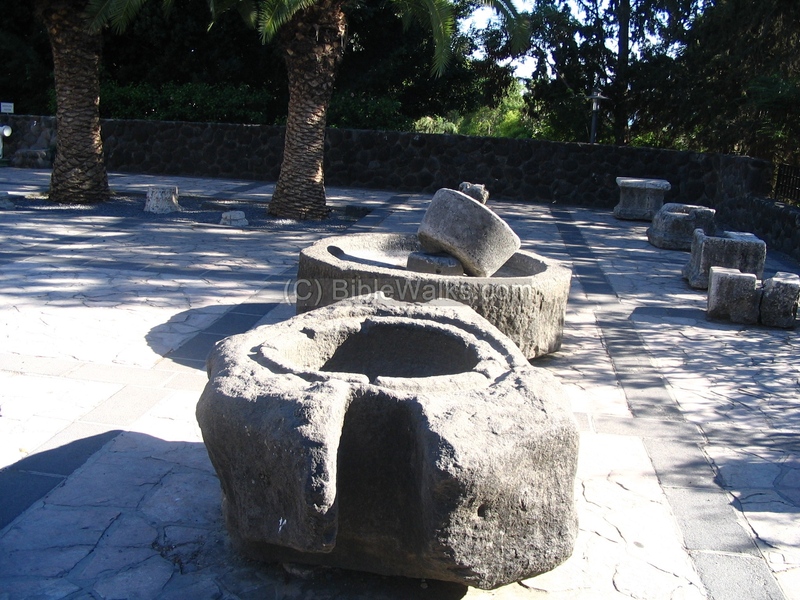 The oil press device was the second step in the olive oil production, where the crushed olives were pressed with force in order to extract their juice. 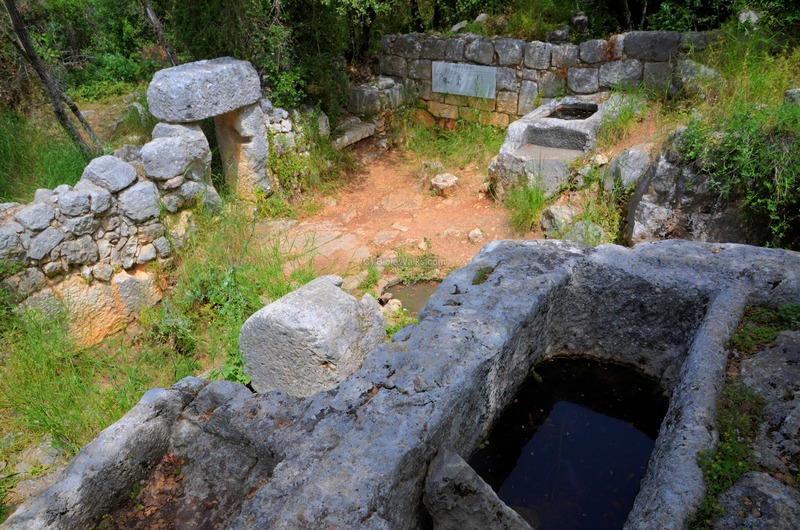 There are several common types of ancient oil presses, which did not change much after the Hellenistic period. These were classified into several types, which were defined and numbered in Rafael Frankel's doctorate thesis. The most common oil press types are detailed below - #4 (lever based), #7 (direct pressure screw) and #6 (lever-screw-cylindrical weight) . 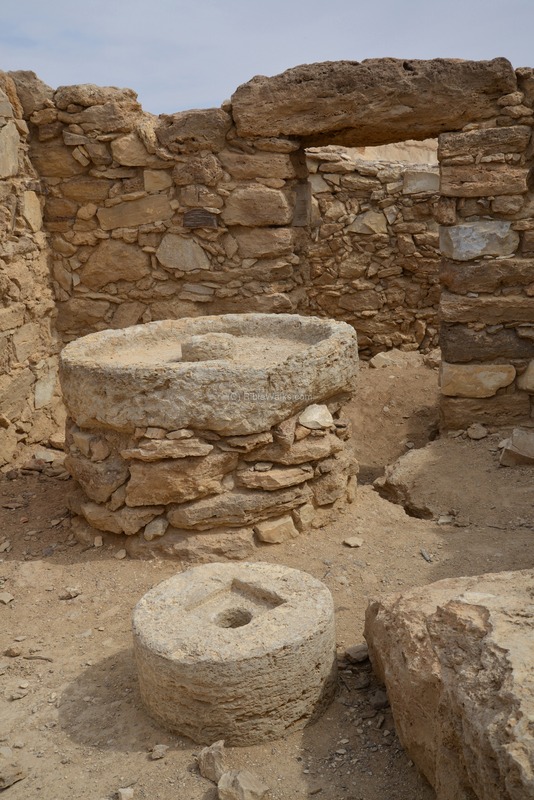 A reconstructed oil press, seen below, was found in a 8th century BC four-roomed house above the palace in Tell Hazor. 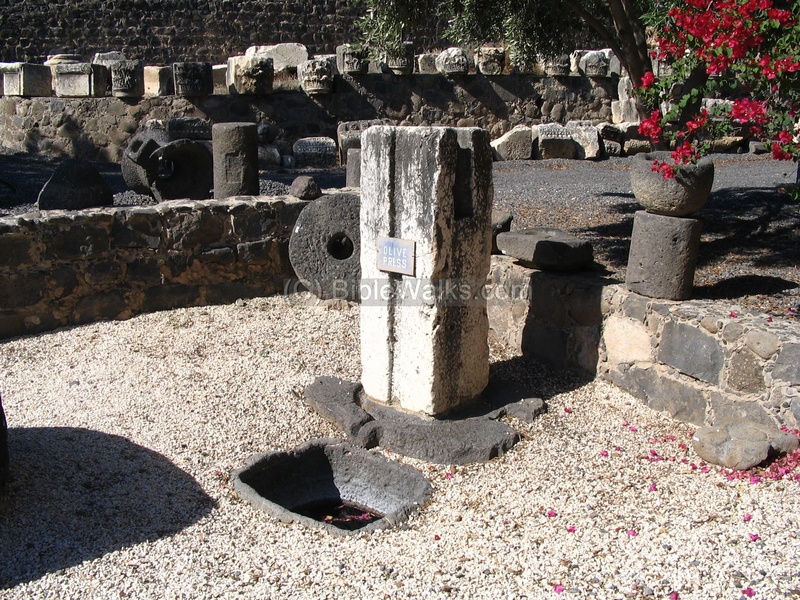 This is a typical lever-based oil press which was in use in the Biblical periods. 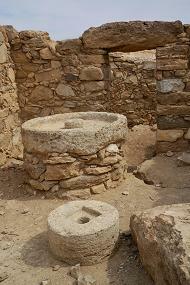 Later the oil press evolved into other types of machines. 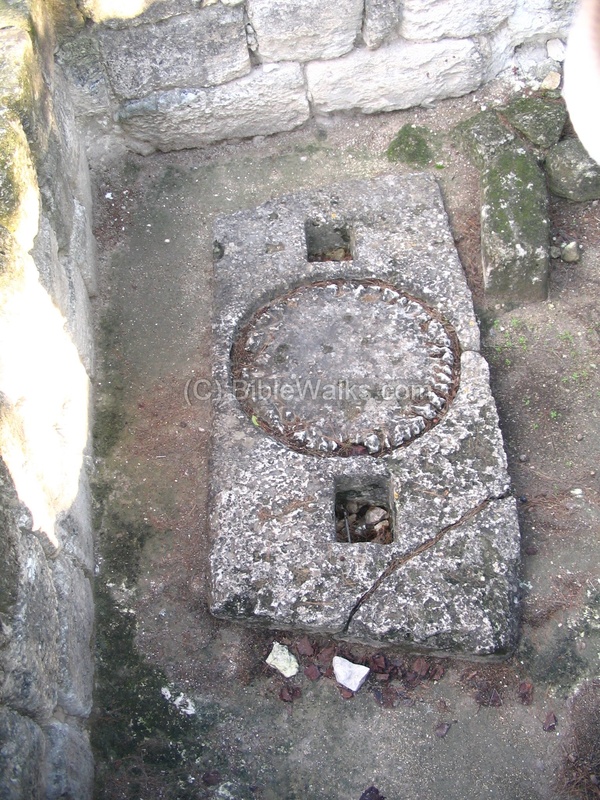 In this oil press, a stone weight was tied to the edge of the wooden lever, pushing the lever down. The use of a lever exerts a large force over a small distance. 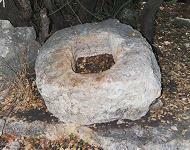 The force of the lever pushed a flat stone down on a basket, which contained the olives. 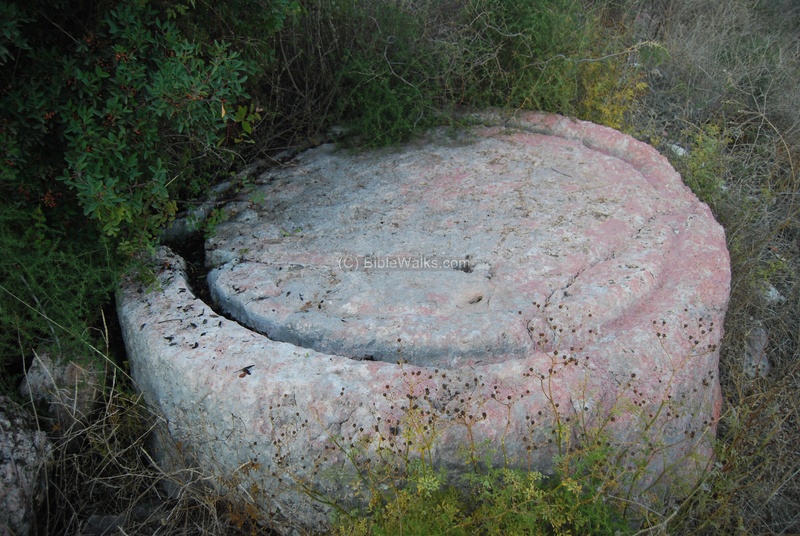 The stone squeezed the basket, extracting the precious olive oil unto the round grooves of a basin stone. The juice flowed down along these grooves, out through an outlet in the basin, and down into a collecting vat. The olive juice contained water and oil. After a few days, the lighter oil in the juice floats above the water, and it is then collected and stored in jars. 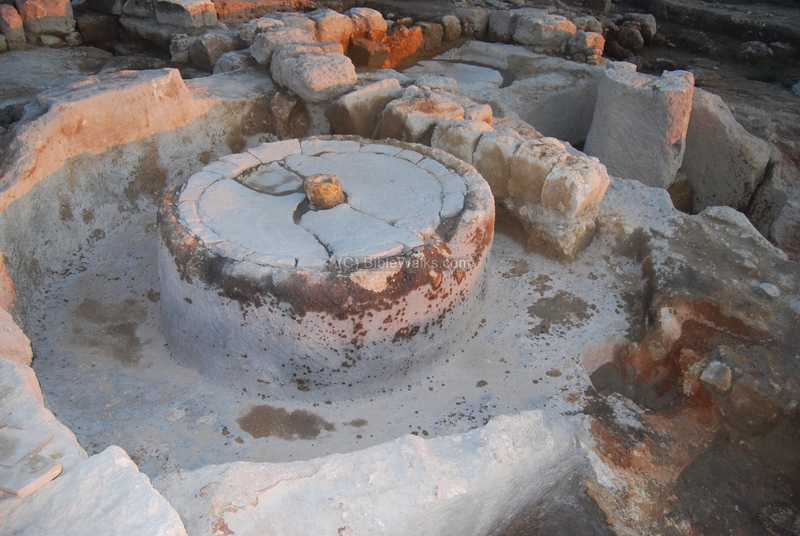 A direct-pressure oil press, seen below, was found and reconstructed in a 5th-8thcentury AD church in Kursi. 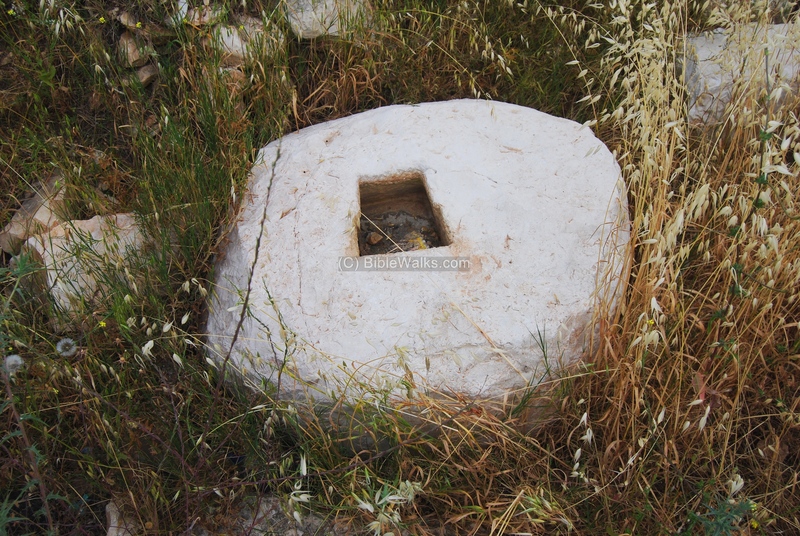 This is a typical screw-based oil press, using a direct pressure crushing method. 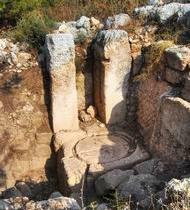 It was widely used in the Golan and Galilee in the Hellenistic and Roman/Byzantine periods. In this oil press a vertical screw was fixed inside a wooden frame. 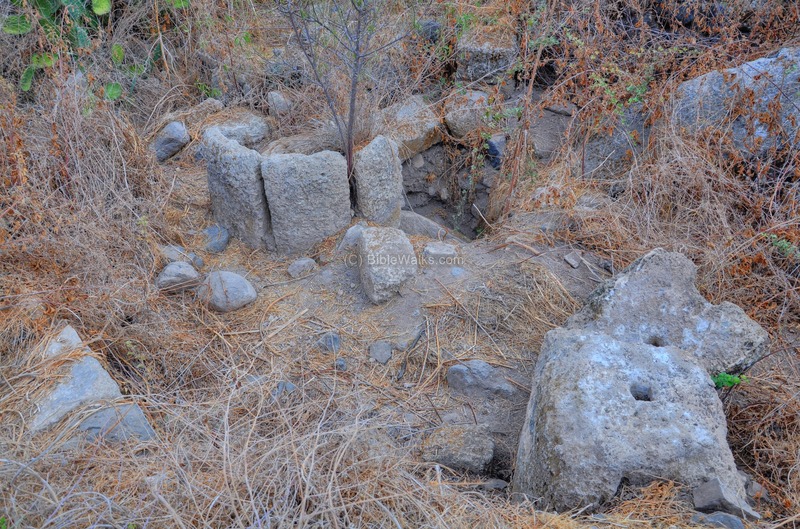 The frame was supported by a stone base with holes on each side. The screw was turned around with a short handle, which pushed down a crushing stone upon the basin. The juice flowed out from an outlet into the collecting vat. This type is a hybrid of the lever based type and the screw type. The pressure on the lever, pushed down by weights, was replaced with a screw that pushed down the lever. A wooden lever (not seen in the photo) was held on its two edges by a niche in the wall and a screw installation on its other end above the weight. A wooden installation was connected to the side of the weight, held upright by the twin mortises (cavities) on its side. The cylindrical weight, normally weighing between 1.5 to 4 tons, forced the lever down when the screw was tightened up. The lever pushed down the baskets of olives which were placed on top of the basin. The extracted oil then poured out of the outlet into a collecting vat. An illustration of this type is displayed at the side of an oil press in H. Danaila. 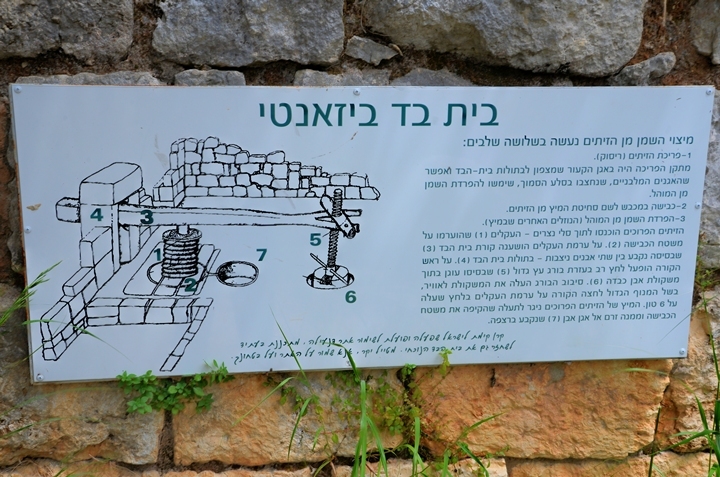 A sign (with Hebrew title: "Byzantine Oil press") on the eastern wall describes the operation of the oil press, and illustrates its design. 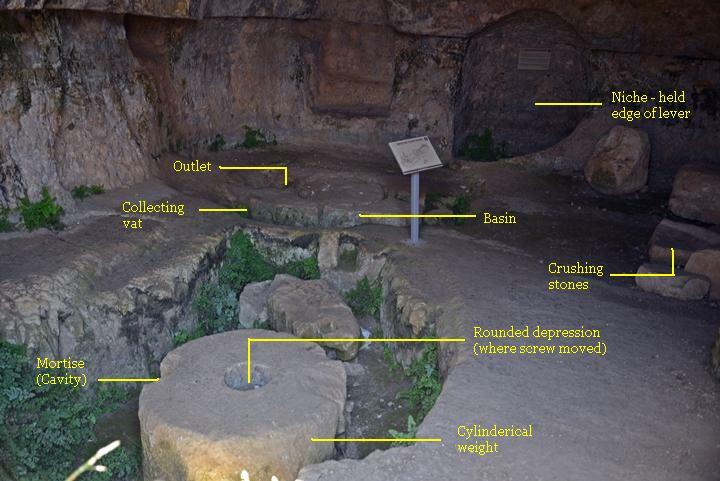 The legend of its elements is as follows: (1) baskets with crushed olives, (2) pressing base, (3) lever, (4) arch, (5) large wooden screw, (6) cylindrical weight, (7) collecting vat. 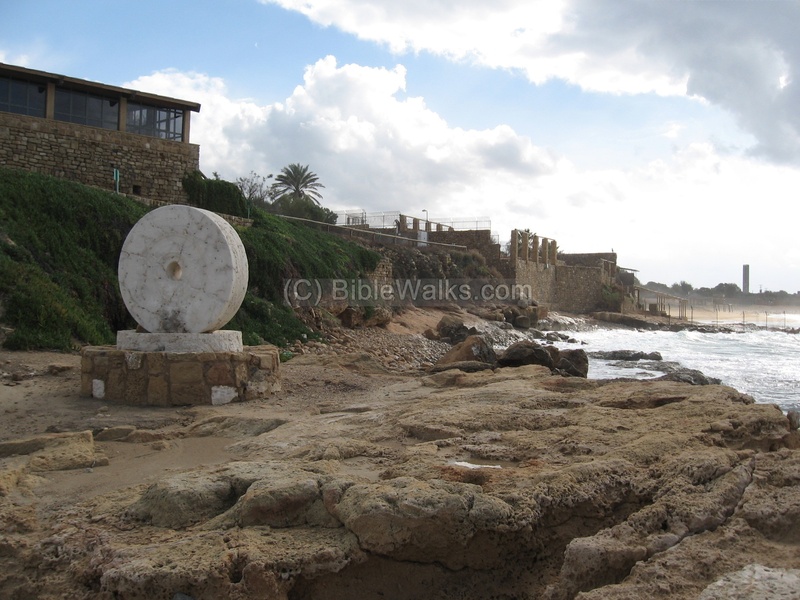 The following table lists the sites of oil presses that are featured in BibleWalks. Click on the site's name to see more information on each site, or on the picture to view it in higher resolution. The press is based on a horizontal beam made of wood, which hanged on a pair of vertical pillars. 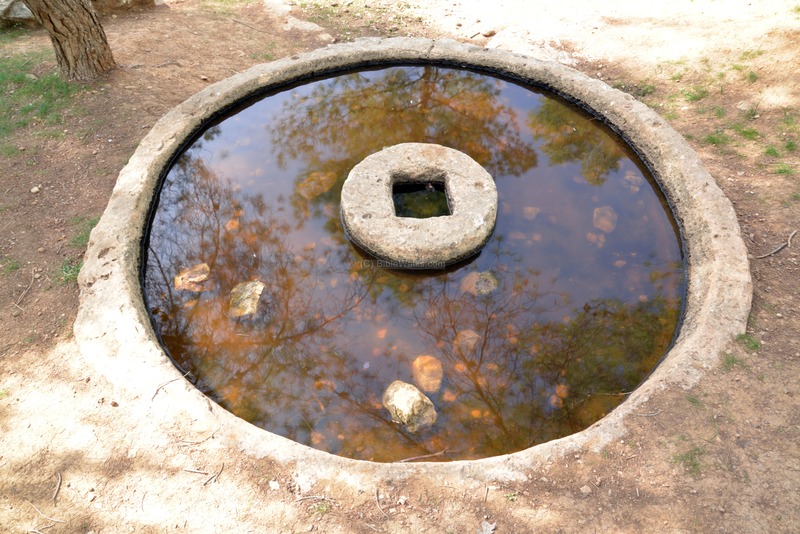 The beam was pushed down, using a set of stone weights, onto a round crushing basin. 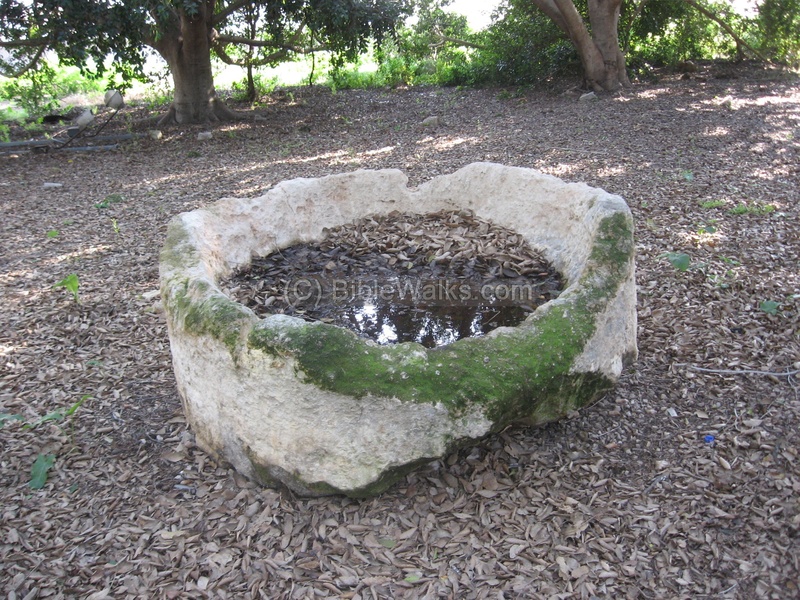 It pressed baskets with olives, extracting their juice which flowed into a collecting pool. The oil was then collected into vessels. 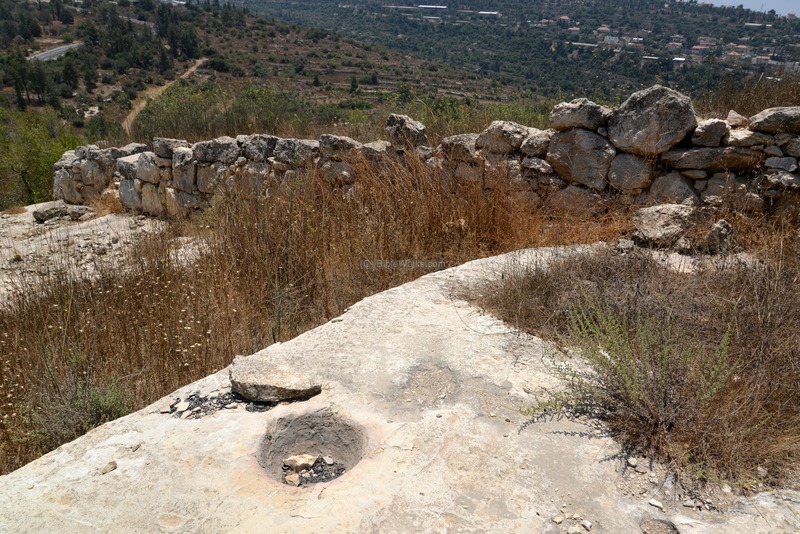 On the north-western side of the site, below the houses, are remains of an oil press. Some of its other parts were robbed in the past. 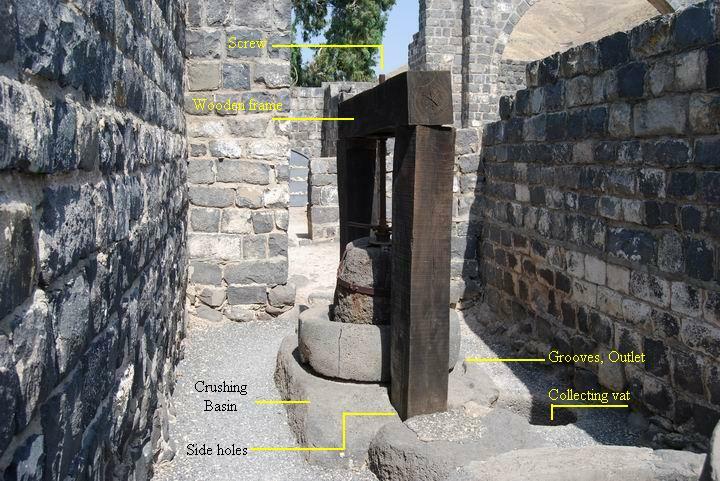 "beam and screw"
A display of oil presses in front of the Church of the first Feeding of the Multitude. 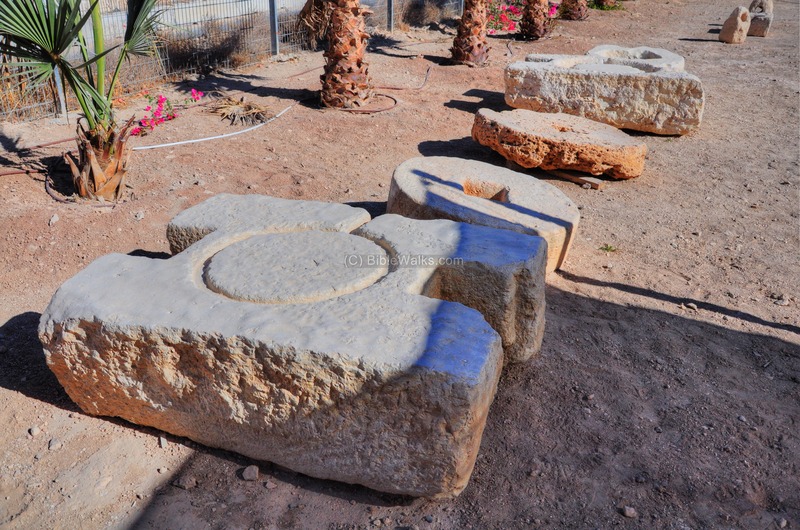 A collection of oil presses, collected from different excavations in the West Bank and Gaza. Katzrin Two types of oil presses. 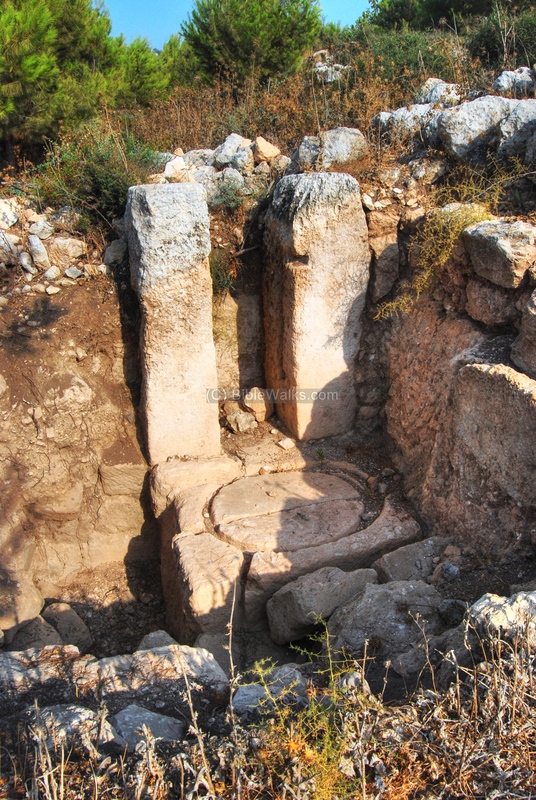 The well preserved oil press is located inside a Hellenistic period Mansion, west of the Samaritan's holy precinct of Mt Gerizim. It includes a crusher, presser and store rooms. 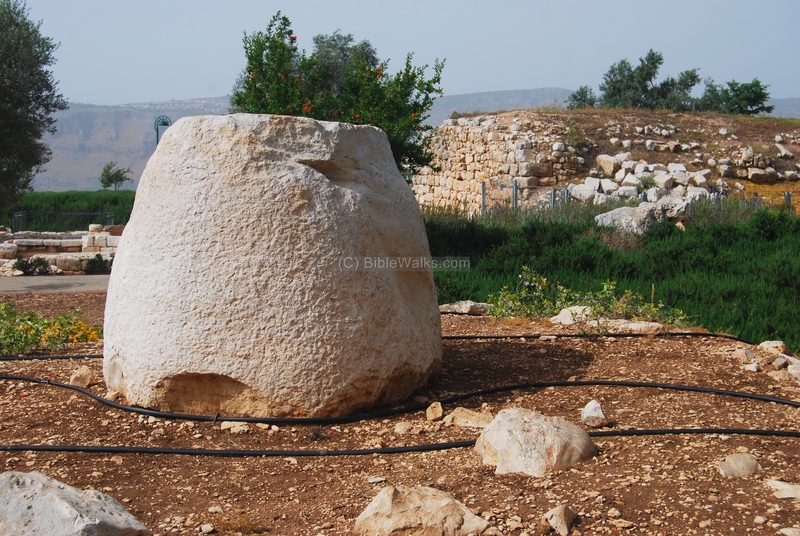 Kesalon A small scale oil press, based on a rock hewn cup mark (Hebrew: Saflul). 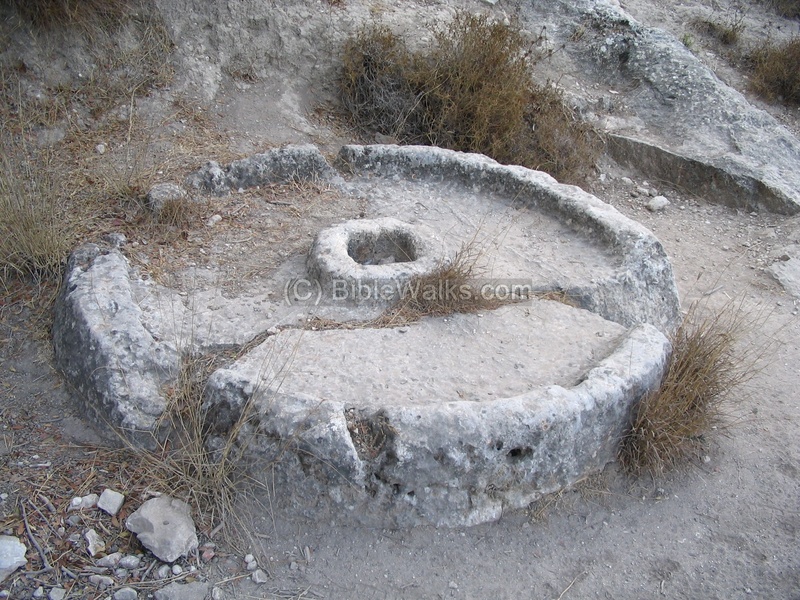 (Northern Judea) Underground oil press. Type #6 - lever, screw and cylindrical weight. 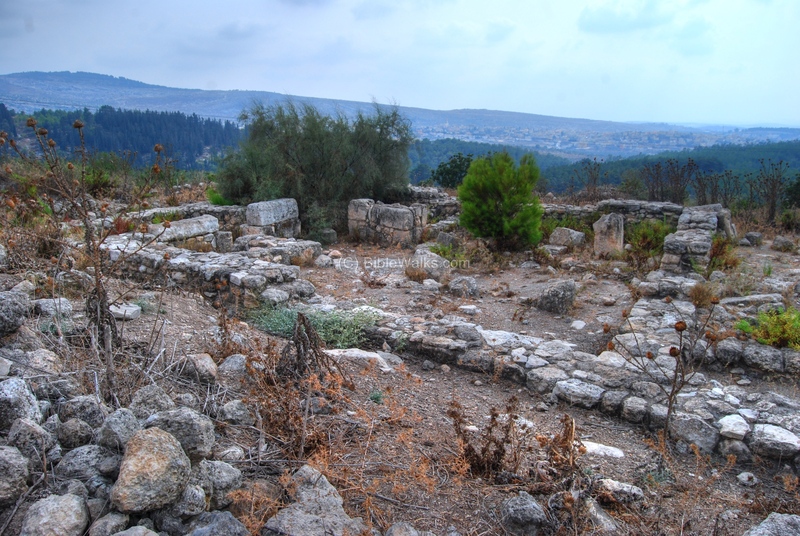 Used up to the Early Arab period (7th-10th century AD). (Kh. 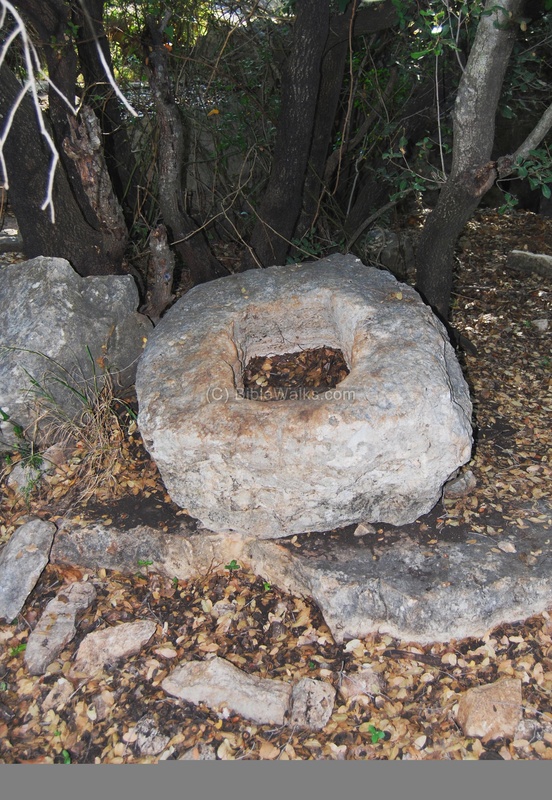 Inaileh) Byzantine oil press in the northern edge of the Upper Galilee village. 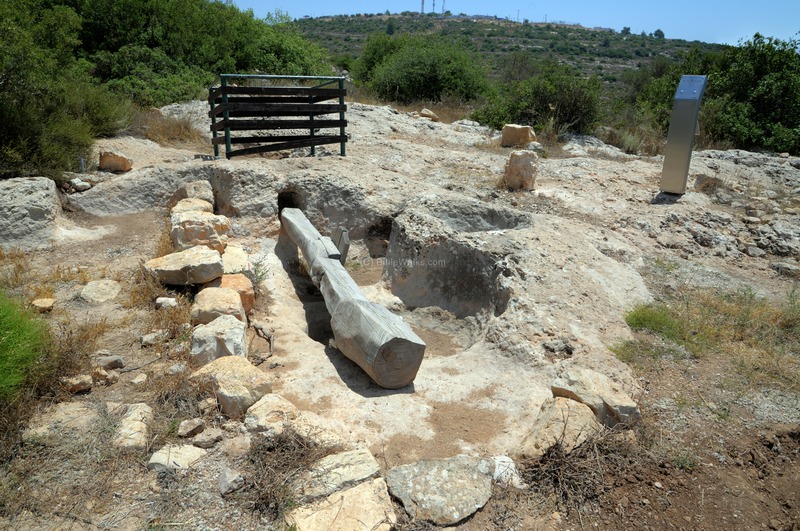 One of 3 oil presses unearthed inside the ruins of the village. Type #6 - lever, screw and cylindrical weight. 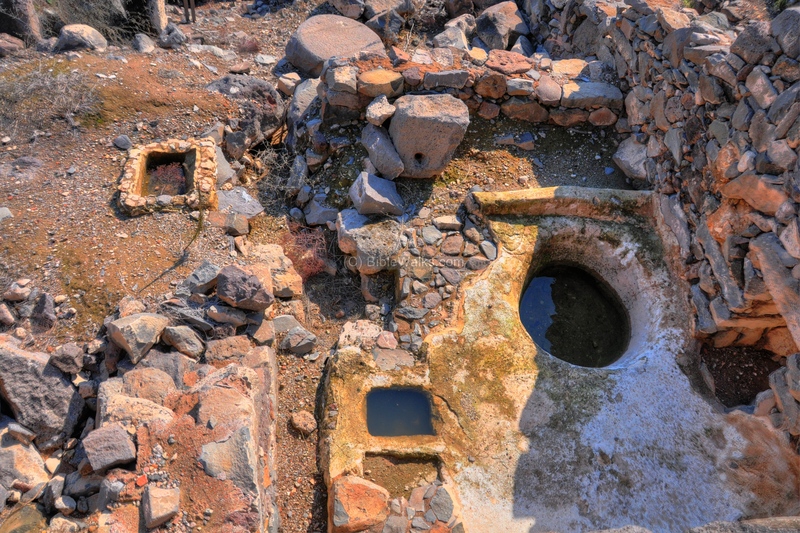 Byzantine; used up to the Early Arab period (7th-10th century AD). Shemen - Oil in Hebrew.